The Piaggio MP3 belongs to a family of three-wheeled scooters that use a trick parallelogram suspension set up to allow you to lean the bike into turns. LT (large tread) versions like this one qualify as tricycles and can be ridden on a car licence. Unlike the Yamaha Niken three-wheeler, the MP3’s suspension can be locked out at low speed, meaning it will stand up on its own. This Piaggio MP3 LT 300 Yourban has a 278cc engine that produces 22.8bhp and is capable of a top speed of 70mph. Despite the added weight of that suspension and extra wheel, the Piaggio is surprisingly good on fuel, managing around 80mpg. Due to the extra wheel it is incredibly stable in all conditions and is untroubled by potholes and rough surfaces, giving the rider huge confidence. If pushed beyond the limit of grip, the front will understeer rather than low side. 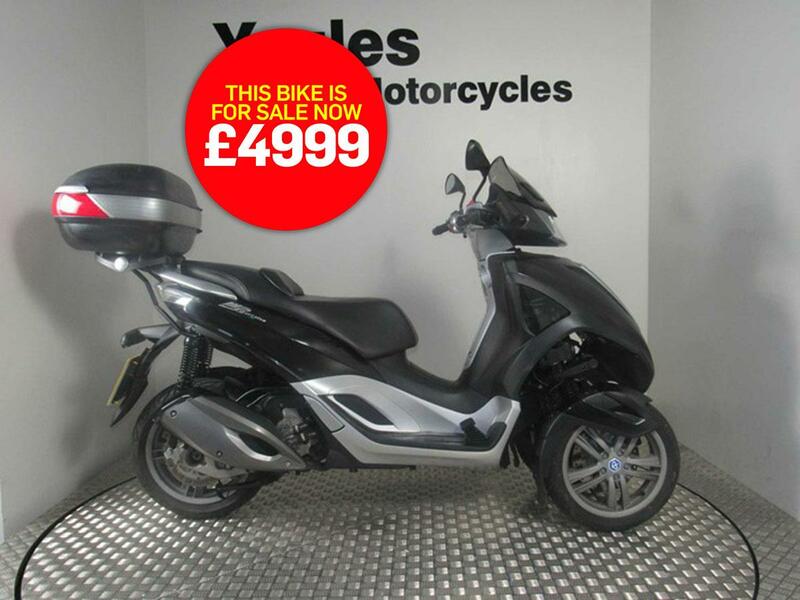 Youles Motorcycles say, "In stock at our Blackburn showroom we have this 2016 Piaggio MP3 300 Yourban LT in excellent condition with just 3694 miles covered. "This bike was originally supplied by us from new and has only had one owner. It is fitted with a large top box and can be ridden on a car licence, making it an ideal alternative on your commute. "For more information please contact a member of our Blackburn sales team on 01254 277122. We guarantee this bike for four months or 4000 miles down to the last bulb."